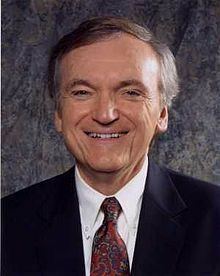 Robert John Brinker (born 1941) is an American financial advisor and radio host. Since 1986, Brinker has hosted the syndicated financial radio show Moneytalk. He previously had a show on local New York radio on WMCA. Prior to that Brinker hosted talkradio programs on WCAU (now WPHT) and WWDB in Philadelphia. Brinker grew up in Philadelphia and graduated from La Salle College High School. In 1964, Brinker graduated from La Salle University with a B.A. in economics. He then did master's degree studies in communications and finance at Temple University and became a news anchor with Philadelphia news radio station KYW in 1966. In 1970, Brinker joined Provident National Bank as a portfolio manager. In 1973, Brinker became an investment officer with New Jersey National Bank. While working in New Jersey, Brinker was adjunct professor of finance at Rider College in Lawrenceville, New Jersey. Brinker was a vice president and investment counselor with the Bank of New York from 1974 to 1981. Then from 1981 to 1992, Brinker was U.S. chief investment officer with the London-based British firm Guardian Royal Exchange Assurance. Brinker is a member of the CFA Institute and the CFA Society New York. During the late 1970s, Brinker hosted weekend talk shows on WCAU and WWDB in Philadelphia. Brinker also became the play-by-play radio voice for La Salle and Villanova college basketball. In 1981, New York City radio station WMCA hired Brinker to host an investment talk show. ABC Radio launched Brinker's current nationally syndicated program Moneytalk in 1986. The show currently airs on over 200 radio stations nationwide and is also streamed worldwide on the internet. Brinker also began publishing the Marketimer newsletter in 1986. Marketimer covers market timing, the Federal Reserve, and mutual funds among other topics. Marketimer is listed on the Hulbert Financial Digest Investment Letter Honor Roll. Moneytalk airs live on Sundays from 4 to 7 p.m. (Eastern Time). In 2014, talkers.com named Brinker to its list of the 100 most important radio talk show hosts of all time. Brinker lives in Henderson, Nevada. He is married and has three grown children. Brinker has also lived in Cocoa Beach, Florida.